It’s here! 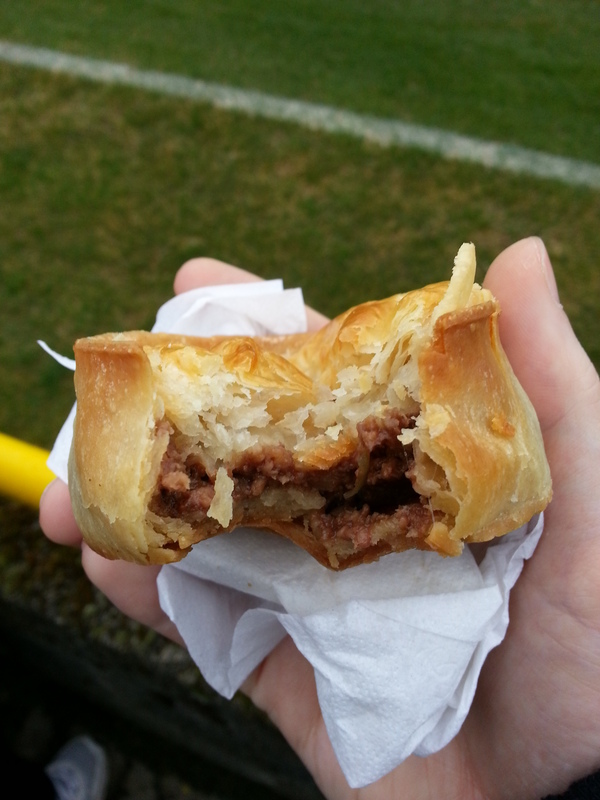 After two season of meat flavoured sweat and tears pie 100 in this enduring journey of pastry has finally arrived and for many there would be no pie more fitting to commemorate a century of meat filled wonder than by reviewing the much vaunted Killie Pie at the Scottish Junior Cup Final. A pie almost so legendary in nature that is often perceived as the best that Scottish football has to offer (although those that read my World Scotch Pie Championships Judges Story will know that wasn’t in fact the case) and the one, above all overs, that I get asked about the most. This pie also signifies my last review of the season, and the last to grace these pages. Whilst I am conscious that there is still a plethora of pastry for me to plough through, not only in Scotland but across the globe, I have also been been starting to feel the need for a break from pastry based writing. Well a break of sorts anyway. You see recently a discussion with a friend (which one I can’t remember but if you’re confident enough that you can take credit for this then let me know) about my journey’s and how I had become a little fatigued about the pie life at which point he/she asked me if I had ever thought about writing a book based on my adventures. At first I kind of laughed it off, as cult-like as Meat Filled Pastries has become would there really be an appetite (pun intended) to actually create a tome of pie? However the more I thought about it the more it made sense. When I looked back at old reviews I could see a story waiting to be written. One of my journey, of the people who I have shared each step with, of the places I’ve visited and some of the downright ridiculous situations I’ve found myself in all thanks to the humble pie. It’s a month or so after I stared putting the feelers about what interest, if any, there was in hearing my story and to my surprise more than two people seemed keen, and so, considering I started this site on the premise of zero percent interest and watched it bloom, some genuine interest was all the incentive I needed to commit to sitting down and trying my hand at being an author. I haven’t started as of yet, work will begin as soon as this last review is posted, but it’s safe to say that I am as excited about this next chapter (another pun, this time unintentional) in my story as I have been about anything else related to Meat Filled Pastries for a while. Although I will be taking a break from fresh pie reviews, I will still be keeping my quill in the ink pot when it comes to pies and football. I have recently been asked to review a bakers full range of pastries and I will continue to share my tuppence worth about the beautiful game when requested. But for now I think I have rambled on enough, and so without much further ado, let’s rate not just any pie, but Pie 100, The Killie Pie! Price: Now such is the legend of this pie that in a handful of junior grounds in Scotland the Killie Pie is offered as an alternative to their own brand scotch variety, in fact Browning’s have done such an impressive job of bigging up their pastry that some have even escaped the terrace kitchens and made their way to the supermarket shelves. 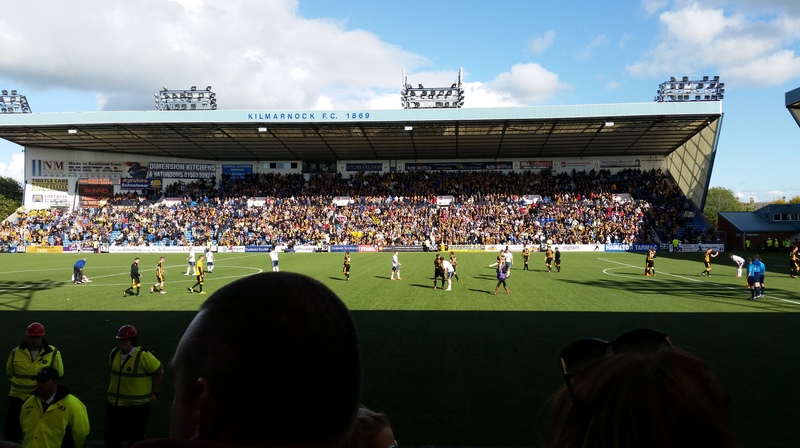 With such wide-ranging availability there was often a temptation to take the plunge at a venue other that Rugby Park, particularly due to the fact that a Killie Pie at the likes of Hurlford United, is cheaper than that found at Kilmarnock FC itself. I resisted those economically sound overtures however and awaited until I was in the aforementioned pies natural surroundings before taking the plunge and as such was required to part with £2.20 for my pie. A full 70p more expensive than those on offer at Blair Park but still considerably cheaper than those found at the big three of Hampden, Ibrox and Celtic Park. Presentation: In a metal tin foil container to retain the heat with the option of a small napkin to be taken from the dispensers located at the back of the kiosk. Luckily these were self-service as realistically you needed at least two to provide full coverage and to prevent any spillages. But if there’s two hands holding the pie, how on earth did you take the picture? Meatiness: So did it live up to the legend? Well, kind of. 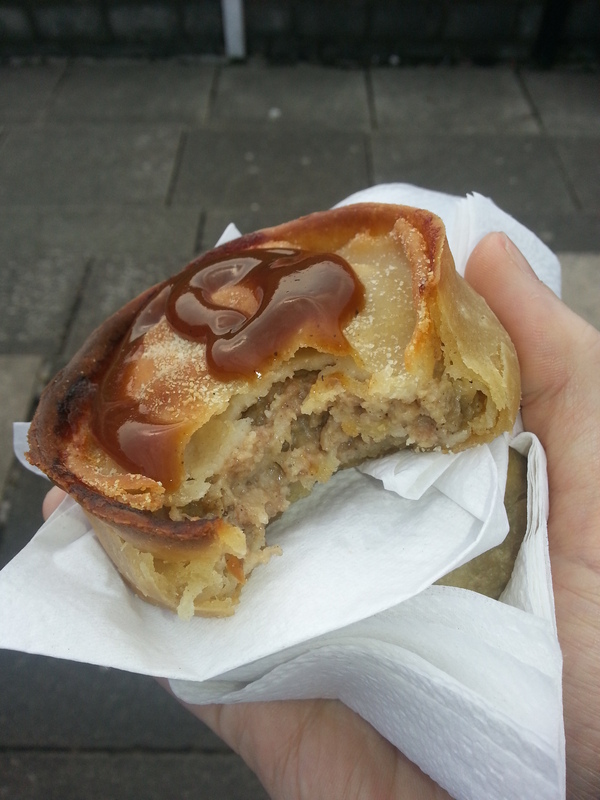 When it comes to luxury pies, I am forever going on about the sumptuousness of the gravy and with the Killie Pie there is very little risk of your lips remaining dry as there really is a gush of meaty flavour heading down your gullet as soon as you take that first bite. It was perhaps slightly salty for some if I’m being honest, the seasoning on the very edge for those with a blander set of tastebuds than myself. There were some nice chunks of well cooked tender steak in this pie, but the emphasis here should be placed on the word some and the none use of the word many or lots. Maybe some drops of gravy could have been sacrificed for a couple more bites of meat, that said it was still a very satisfying mouthful. Pastry: The pastry was pretty tasty with a nice buttery finish, however a couple of things bugged me about it. Firstly the puff pastry top sagged a little in the middle. While that led to strong mingle of gravy and pastry it meant that as you bit down it became really difficult to get a one bite expose. In fact the only way this was achieved was by squeezing the pie a little to open it up. The base had also fell foul of its tin foil container, and while not sticking this pies soggy bottom meant a fair bit of juggling was required to complete consumption. Brown Sauce: It was a luxury pie. There is no brown sauce. If you were expecting sauce then quite frankly you should know better. Overall: Was this a very good pie? Yes. Was it the best pie available on Scottish football’s ever critical terraces, I don’t think so. While the gravy was tasty it could have done with some more meat and if you insist on using a tinfoil safety net to house your pie then you must, must prevent the soggy bottom which this pie unfortunately had. Gravy Factor: The kind of gravy that you’d get from Five Guys only to find later that actually a Big Mac is just as good. Tasty gravy but the best I’ve ever had, I’m afraid not. 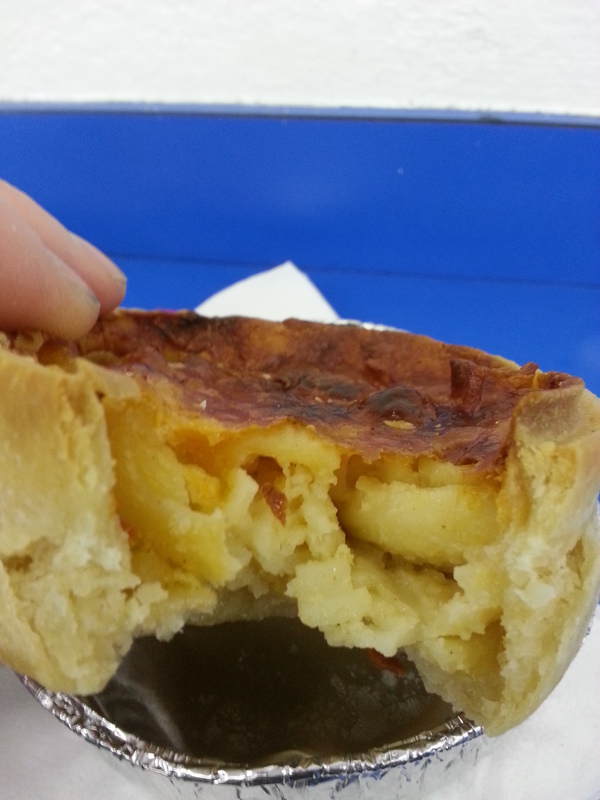 So there you have it, The Killie Pie, finally reviewed and with that this journey sets off in a new direction. As I said I’ll still be keeping my toe in the water and you never know, after writing one book I might summon up the enthusiasm for another run at the life of pie, but for now the time is right to focus on taking over 70,000 pie based words and making some sense out of it all. Before we wrap up I just wanted to say a big thank you to everyone who has helped turn this into more than just a drunken notion and into a project that has been a lot of fun helping to re-ignite something within me that had been slowly dying as the 9-5 so many of us have to live to survive dragged me further in. Until next time, whenever that may be, go forth and eat pie! I know I will. This entry was posted in Football Pies, Junior Pies, Professional Pies, Sporting Pies, The Life of Pie and tagged auchinleck talbot, fitbaw, Football, Gravy, junior cup final, Juniors, killie pie, kilmarnock, Meat, meat filled pastries, musselburgh athletic, pastry, Pie, pie 100, rugby park, steak, tartan army. Did this pie make my eyes water? It’s pie time. A new review and a somewhat luxury offering from Auchinleck Talbot awaits. In my eyes a pie is plenty when it comes to match day sustenance, maybe two but for some the option of a side dish is one that turns their trusty pastry snack into a full blown mid-afternoon dinner. Sides often include but are not limited to chips, soup or in this case a generous dollop of mushy peas. 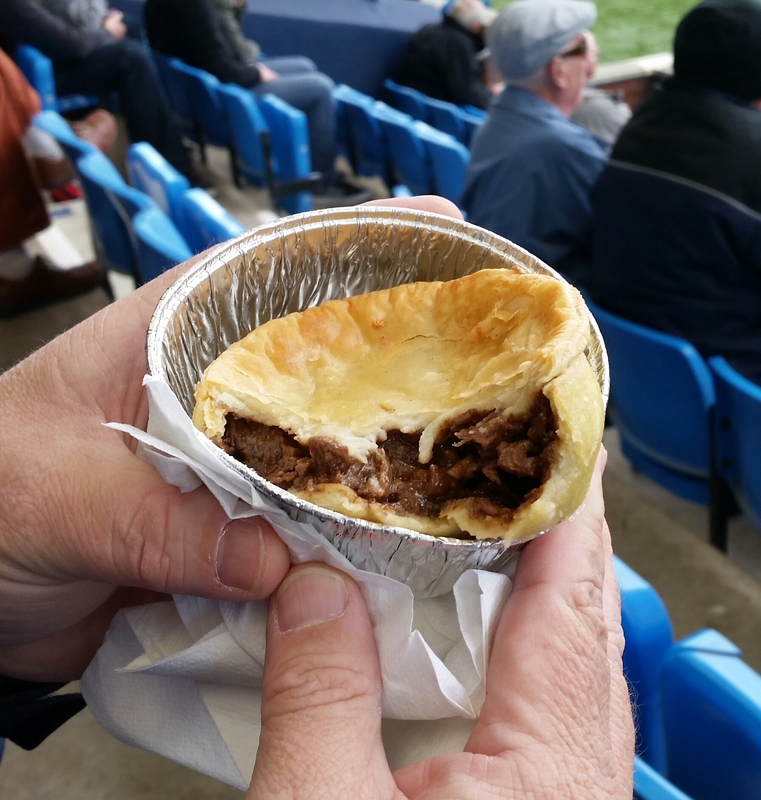 In fact whilst living in Brighton, I often attended games at Lewes FC, where on one occasion a chap leaning on the barrier to my side advised me to poke a hole in my pie, which I should add was a steak and kidney delight, and pour my Bovril straight inside! People will have their own little pie eating rituals even if they don’t realise it but me; I like my pie to fly solo perhaps even more so since the creation of Meat Filled Pastries. Look out for your pie eating ritual next time you’re about to take a bite. But anyway rituals aside and without much further ado, let’s rate some pie! Price: £1.20. The same price as the standard pie offering from Auchinleck and as such almost single-handily throwing my theory out the window that a ‘luxury’ pie has to be significantly more expensive that its standardised contemporaries. Presentation: Although this pie is packed with onion it was still lovingly dressed in the medium-sized white napkin often seen nestling snugly underneath many a pie across the land. Meatiness: So what is the difference between a normal pie and an onion pie? Well the first thing you notice is the smell and I don’t mean that to cast a negative light on the filling inside this pie in any way. In fact to be honest I’ve never really though about how a pie smells until this one wafted past my nostrils with its distinctly sweet smell of onion almost immediately putting my taste buds on high alert. Something new in the world of Meat Filled Pastries was about to happen. I took my first bite and was greeted with a combination of fine mince and thick gravy rounded off with some clearly visible slivers of near translucent onion within. The taste was predominantly of meat but you could not ignore the distinct oniony undercurrent adding a layer of flavour not found in your standard scotch offerings. Ironically enough after saying in my last review (Pie 58: The Auchinleck Talbot Pie) that I didn’t require any brown sauce upon it I couldn’t help but wonder if this luxury offering would have been enhanced even further with a wee splodge of brown sauce but it’s was just fine without. I was worried this was a bit of a gimmick but it actually turned out to be a very different animal indeed. Pastry: A puff pastry top with a golden pastry surround and base it was almost identical to the mince and gravy offering from the same club but for the two holes popped in the lid which in retrospect probably help the scent of onion enter into my nostrils. It held well in my hand and even after squeezing it a little to show more of the filling for that crucial one bite expose the pastry remained intact until my consumption was complete. Overall: Is it a luxury pie? I’m still not 100%. sure In essence it was your standard pie with a few extra onions through it but it would be remiss to ignore the definitive deviation in flavour that these eye watering roots supplied. I would maybe add some brown sauce next time but it was perfectly lovely without it. Another pie done and as such I can concentrate on something that’s not pie related for the rest of this week. Your next helping of pie will come from Cumnock, Auchinleck’s nearest and fiercest rivals. Let pie battle commence! This entry was posted in Football Pies, Junior Pies, Luxury Pies, Sporting Pies, The Life of Pie and tagged auchinleck talbot, brown sauce, cumnock, Football, football blogging awards, Gravy, junior football, leadingtheline, Meat, meatfilledpastries, mince, onion, Pie, pollok.